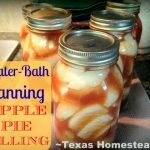 This recipe is straightforward and canning requires just a 20-minute stint in a water-bath canner. 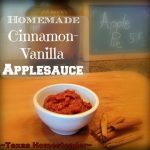 Now I can make homemade apple pie in minutes! 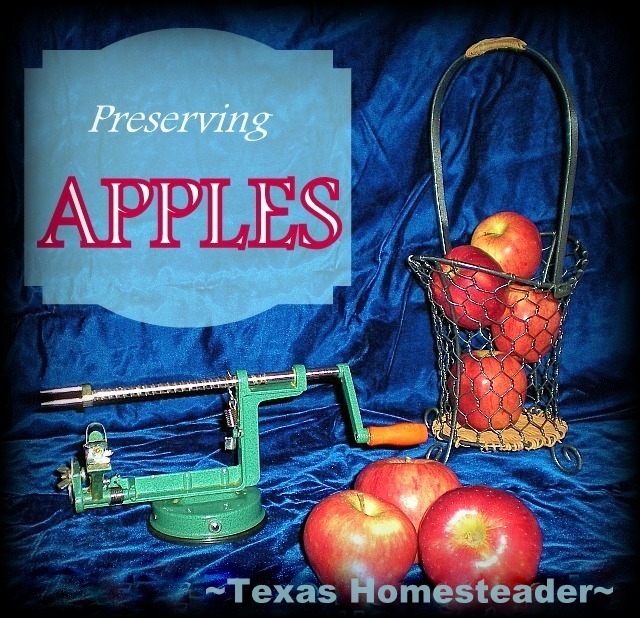 This is the simplest way to preserve fresh apples. Peel/core/slice them and chunk them into a slow cooker to cook down. Then canning them is easy! I’ve made regular unsweetened to enjoy and also use in my baking, and Cinnamon/Vanilla flavored applesauce too! A delicious byproduct of making applesauce – the apple cider. It’s easy to can too. 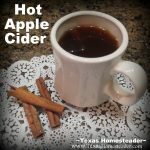 In the cold winter months enjoy a steaming cup of cider stirred with a cinnamon stick to warm you from the inside out. 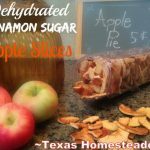 Slices of peeled/cored apples are sprinkled with cinnamon & sugar and then dehydrated. The result is a delicious, crunchy, sweet apple treat! 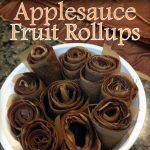 If you have excess applesauce it’s easy to make them into fruit rollups. Just spread them on the dehydrator trays & dry until no longer tacky. Then cut into strips & roll. I’ve made regular and cinnamon/sugar rollups. And they’re both delicious! I haven’t made it to the farmer’s market yet. I had planned on going and getting bartlett pears and apples (everyone I’ve asked about apples said their tree(s) didn’t do well this year). But I did spend last weekend baking pumpkins, processing to get it smooth and freezing the meat (you can’t can pumpkin when it’s been processed for pie). When we went to the pumpkin patch a couple days before Halloween we also went through the corn maze. If you found the answers to all the questions you got a free small pumpkin. We ended up with 5 and I also bought a sugar pumpkin. So I took them home and looked them up. They were called Hooligan pumpkins or my older son said they were called lightning pumpkins in New York. If you get the chance I recommend the white ones. They are orange in the indentation and either white or yellowish (with orange spots) on the part that bows out. I saved seeds so hopefully I can get them to grow next year. They are so sweet and good, but I found the white were a little sweeter. My next project will be making my mom’s recipe for cranberry sauce and canning it. Oh! And I have yogurt (your recipe) in the oven incubating as I write this. Kaleigh love, love, loves homemade yogurt! I have never made a pie with cooked apples (I generally freeze them cut up, but that does take a lot of freezer space), but we’ve an abundance this year so I do believe I will try canning the filling! Thank you for the idea.